Don’t you have any fancy ingredients in your pantry but you are craving for something sweet so badly? Give this simple Turkish Halva Recipe a try. You only need 6 ingredients and a little time for this thick and creamy dessert. This is a very easy but wonderful dessert especially when you have limited ingredients. 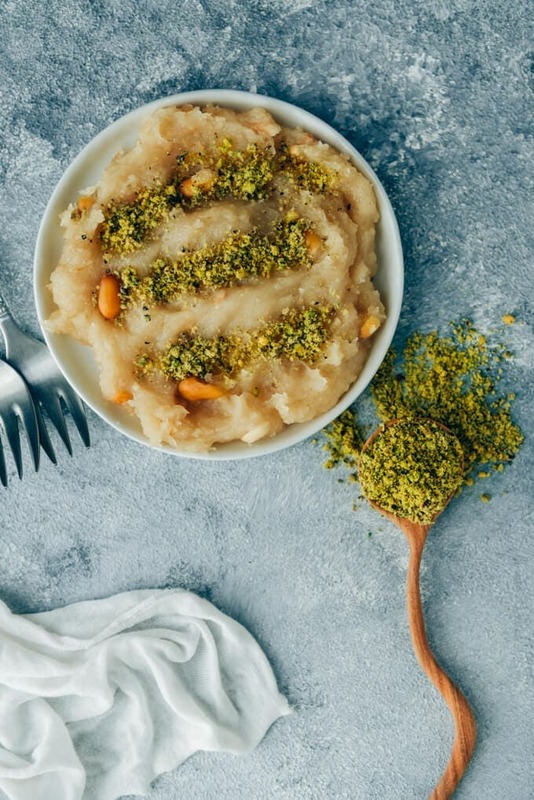 If you don’t have much time or enough ingredients for making something special for your guests at an afternoon tea party, this Turkish Halva Recipe is just for you. You basically need 4 ingredients to make it: Butter, flour, sugar and water. If you want to enrich your halva, you can add nuts into it and top it with something like pistachio or cinnamon. These two additions are absolutely optional though. In Turkish cuisine, there are two types of halva that you can make at home. One of them is Semolina Halva and the other is Flour Halva. Both of them are mostly served at funerals, but also known as a family dessert. They are grandmother type of desserts, so either of them is a staple at family gatherings. My grandma was really good at making this simple dessert and it always reminds me of her. So I’d like to share this halva recipe in memoriam of my dear grandma. Interested in Turkish food and want to learn more? Go check out our Homemade Turkish Delight Recipe too! Prepare the syrup first. Combine sugar and water in a pan and bring it to boil. Let it simmer for a few minutes and then remove from the heat. Melt butter in a large pan and add in flour and nuts if you are using. Stir it well using a wooden spoon and bring it to very low heat and keep stirring until the flour gets golden brown and you feel a toasted aroma. Remove it from the heat. Pour in the hot syrup when the flour is golden brown and removed from the heat. Keep stirring it as it cools down. You will see it holds together and forms a ball. Traditionally, you can give it an oval shape using a tablespoon or you can just serve it in bowls or on plates. You can top it with coconut flakes, ground pistachio or cinnamon. If you want to take this simple dessert to a next level, you know what you need: Chocolate! Melt dark chocolate in a heat-proof cup over simmering water. Add this into the halva when you pour the syrup into it and follow the same steps mentioned above. If you are a chocolate fan, I’m sure you will love that version more. 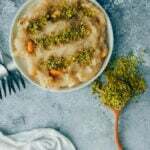 Is This Different From Persian Halva Recipe? Although their methods and the main ingredients are almost the same, they are not the same. Unlike Turkish halva, Persian halva recipe has two more flavors: saffron and rosewater. These are added in the syrup while it is boiling. A super easy Turkish dessert with 6 ingredients. Put water and sugar in a pot and bring to a boil. Let it simmer for about 5 minutes over medium low heat and remove from heat. In another large non-stick pot, melt the butter. Then add flour and peanuts in it and cook over medium-low heat for about 15 minutes or until golden, or you feel a toasted aroma, stirring continually. When it’s done, bring it to the lowest heat and pour the boiling syrup into the pot. Be careful not to burn yourself as it might splash out of the pot. Stir it with a wooden spoon as fast as you can until smooth. When it gets thicker than pudding, it’s done. Serve them in small cups or shape them using a tablespoon or with your hand as in the picture before serving. Top with ground pistachio, coconut flakes or cinnamon. This post was originally posted in 2009 and we are updating it with a new picture and additional information today. I only know halva the way we buy it in the Turkish shops around here, the way I used to eat it as a child as well, my grandma was a fan, so we had it often. But it is made with sunflower seeds, firm and crumbly… I suppose there are different kinds of it. This halva looks delicious, so soft and comforting. Hi Adina! Never heard of halva made with sunflower seeds, interesting. There are various types of halva in our cuisine though. Maybe it’s something I’m not familiar with. This one is the simplest version. Thanks canım! I’m so happy to hear that this was your mother’s recipe too. I’m sure hers was even tastier. What a wonderful delicious looking dish, this looks perfect with tea as you said! These look so delicious and easy to make! They’re like shortbread cookies but the method is different and unique. Thank you for sharing! I love the fact that I am pretty much guaranteed to always have all of the ingredients for this to hand, definitely increases the chances that I will try it out! Natasha – Just as you say, this easy dessert is a great saver. Reeni – It was just how you describe. Sophie – Grandma used to teach several dishes to me when I was a little child. I wish she could see this. Zerrin, I bet you made your grandmother pride!!!!! Well done!! This dessert is easy & looks so yummie:)!! & Thanks for this wonderful story!!! I bet these just melt in your mouth!! I would love to try them! I often find myself in this situation when I am short of time because I focus too much on the main course and then I am in need of a easy and delicious dessert just like that! Thanks for this recipe!